The New River UMC recently held a dedication to celebrate new stained glass windows in the sanctuary. 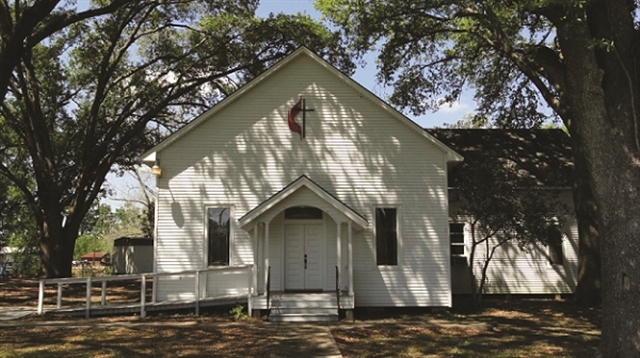 New River UMC, nestled among live oak trees, is located on Hwy 22 in Acy, Louisiana. The church has a history dating back to the early 1900s with a membership today of 73 members. In 1921, a small community group gathered as a Methodist group and were able to build a facility using lumber and materials from an old building in Sorrento. The building was a modest frame structure with hand made pews later replaced by new pews, a project headed by Mabel Delaune. Some of the organizers were the Otis/Maude Felder, Henry/Ella Woods, Lula/Bill Heath, Eugene/Lydia Cannon and Jim/Olivia Cannon. Later, in the 1940's, the O.A. Lowe and R.L. Armstrong families joined New River. They had located in the area to operate a lumber company in Sorrento, and under their direction the church was able to add four rooms, two rooms became Sunday school rooms, one became indoor toilets, and one a kitchen. After the kitchen had been set up, J.E. Savoy built kitchen cabinets. Some of the best remembered Sunday school teachers were Roberta Lambert, Ruth Nell St.Amant and Eleanor Johnston. The church has always included music in the Worship Service. In the beginning, an upright piano was given to the church, replaced by a used baby grand which Hester Stevens headed a drive, and in 2003, under Evelyn Cannon's leadership, the church was able to upgrade to a digital music system which is now used. In 2011 a special sound system was installed. In 2002-03, an office -fellowship room was added to the facility. Donald Krumholt directed, designed and constructed the addition for office space and fellowship functions. The offices are used for the pastor's study and the administrative functions. The fellowship room provides space for special celebrations, weddings, funerals, etc..
More recently the parishioners replaced the original windows in the sanctuary with stained glass. The windows were designed by Carol Lapari Designs with glass from Europe and sections from the original windows. The different windows depict Christian symbols: a cross and crown, the dove of the Holy Spirit, Chalice and bread of the Eucharist and the Trinity window. A dedication was held April 7, 2013 with Bishop Cynthia F Harvey as guest speaker. Numerous former members attended as well as the current active members. Presently, Rev.Russell Clunan is serving as pastor of New River UMC and is shared with a sister church, Faithful UMC. The Sunday Morning worship hour at New River UMC is held at 9:30 a.m.